With global equities up nearly 20% year-to-date, it’s hard to fully appreciate the rally that the crypto markets are experiencing (which has continued into April). But most other risk assets are highly correlated to each other; whereas crypto continues to exhibit near-zero correlations to global equities and other asset classes. The true test of course will be how the crypto markets respond if/when the rug finally gets pulled out from under global stocks. Until that happens, crypto investors and non-crypto investors are both enjoying a pretty remarkable first half of the year. Specific to the crypto markets, after the euphoria caused by 25% gains in the first week of April, most digital assets traded down pretty aggressively last week. While the overall market only declined 5%, a mild pullback following a torrid start to the month, that doesn’t tell the full story. Bitcoin outperformed all other digital assets last week, ending -1%, while many small-caps fell 15-25%. 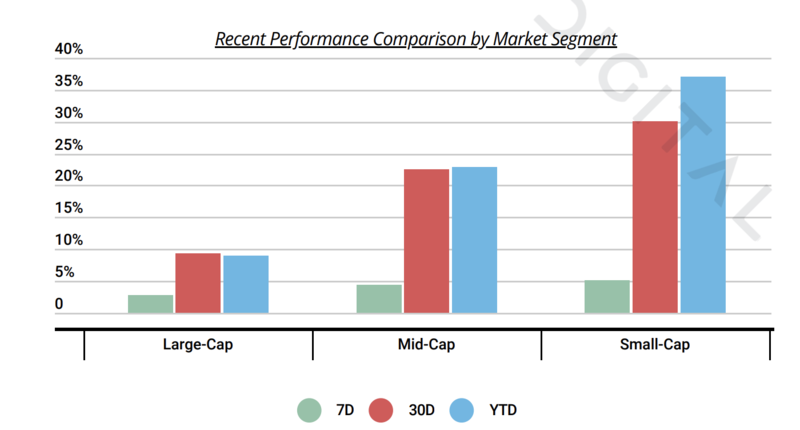 This is a stark reversal from the first few months of 2019, where small-cap cryptos were outpacing BTC by a significant margin. Importantly, this wasn’t a slow drift lower fueled by profit taking. It was accompanied by another fast 10% correction, this time early Thursday morning before U.S. markets opened. BTC itself tested the $5,000 psychological barrier multiple times, each time bouncing off this level fairly easily. While we’re not technical strategists, we feel this resistance demonstrates that investors are more interested in buying dips than panic selling, even when we see a large and quick move lower. Further, volumes remain very healthy, with the CME even reporting record BTC Futures volumes. 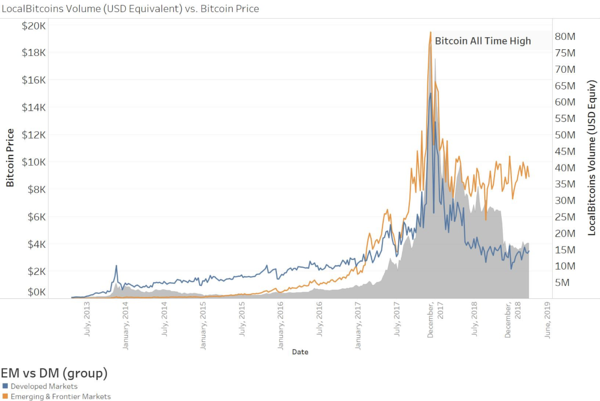 To understand why, recall that BTC matters a lot more outside of the U.S. where it is used as a safe-haven currency or banking alternative; versus BTC usage in the U.S. where it is mainly a speculative asset. As Passport Capital explains, volume in Developed Markets is tracking price (speculation) while volume in Emerging Markets has stabilized and is growing despite price (utility). 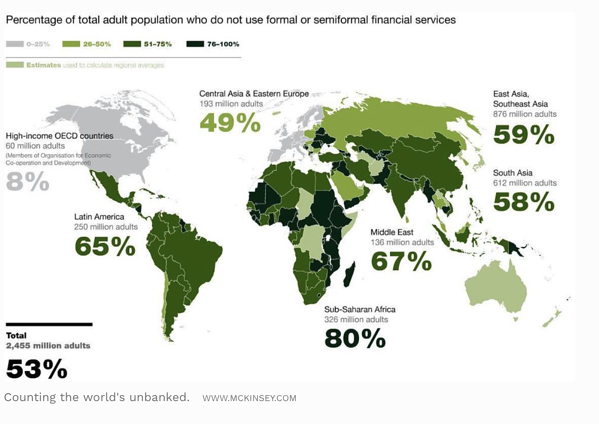 Their entrance into the global financial world won't be via centralized financial services firms sponsored by their governments [much like] they didn't enter the worldwide telephone system with landlines. Leaping over ineffective systems is what the developing world does. When the middle class wants to invest I expect that in 10 years they will be buying index fund tokens and maintaining custody of them. They aren't unbanked because there aren't banks. They are unbanked because they don't trust them. It remains to be seen how the rest of the market will react if BTC continues to leak lower and pushes through this resistance level. But for now, fear seems to be largely absent from investor psyche, which allows investors to keep risk limits high and look for other growth tokens and catalysts that can create outsized returns. During the crisis of 2008-2011, most investment committees focused less on what was IN the book, and instead focused on WHERE it was owned. 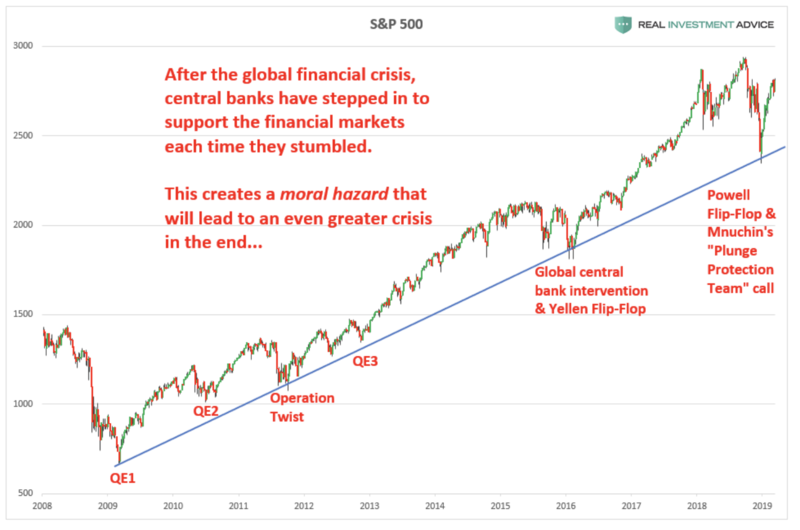 Between Bear Stearns, Lehman Brothers, Merrill Lynch and even Knight Capital, Jefferies and MF Global… asset managers were terrified of counterparty risk. And rightfully so. Binance, the world’s largest crypto exchange, basically froze during the frenzy of April 1st when Bitcoin and other digital assets rose almost 25% in a day. Last week, Coinbase had to cancel all BTC/USD orders for a short-period of time as they experienced issues with this trading pair. Bittrex was notified by the New York DFS that their application for a BitLicense had been rejected and that they had to cease trade operations immediately in New York, leading to withdrawals and possibly the cause of the 10% correction last week. If you’d like to buy an asset, there are usually two questions that you have to answer before you become a proud owner. (1) Do you want to buy this asset and (2) where can you buy this asset. These are normally very easy questions to ask for someone buying a stock. Cryptocurrency is a bit different. Here’s a look at the different ways you can buy XRP. You can buy XRP with BTC. You can buy XRP with BNB. You can buy XRP with ETH. Or maybe let’s just use a stablecoin. It’s basically the dollar. Ok - now where do I buy it (there are literally hundreds of exchanges and OTC dealers)? Cryptocurrency has a fragmentation problem. It has a choice problem. When you’re buying something like XRP — all you care about is the price. You don’t care what you buy it with or where you buy it. For the active traders this exchange arb can be nice. All sorts of price discrepancies. But most people don’t have the time or systems to take advantage. This is the reason we are seeing platforms like Bakkt, ErisX, Tagomi and others spring up. They are all trying to create liquidity pools to make it easier for investors and consumers to buy into the market to ensure they’re receiving a fair price. Once again, we’ll draw the analogy to High Yield bonds and Emerging market bonds, all of which function perfectly fine without numerous exchanges. OTC desks dominate the flows, and provide a valuable service in addition to just liquidity (underwriting, research, price discovery, etc). Fortunately, many full-service crypto firms are getting better at the services they offer. 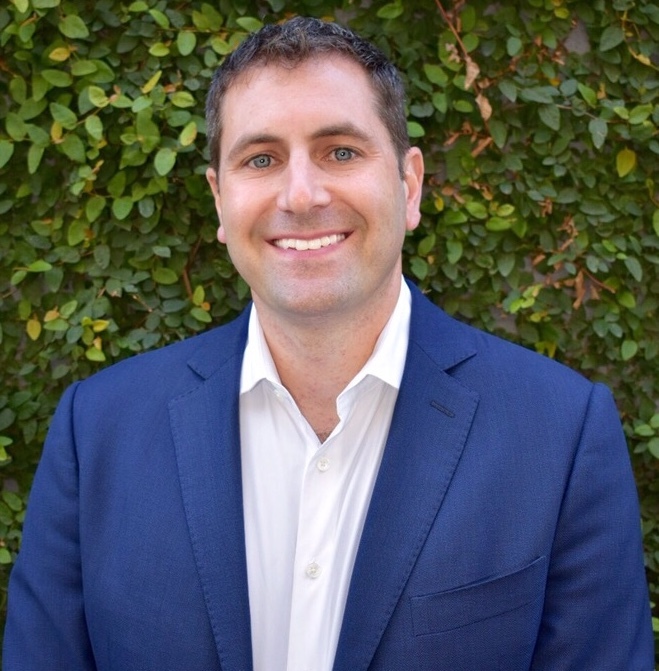 We’re seeing real market color, research, and ancillary services from places like Galaxy Digital, Cumberland, Circle, Genesis and Galois Capital. 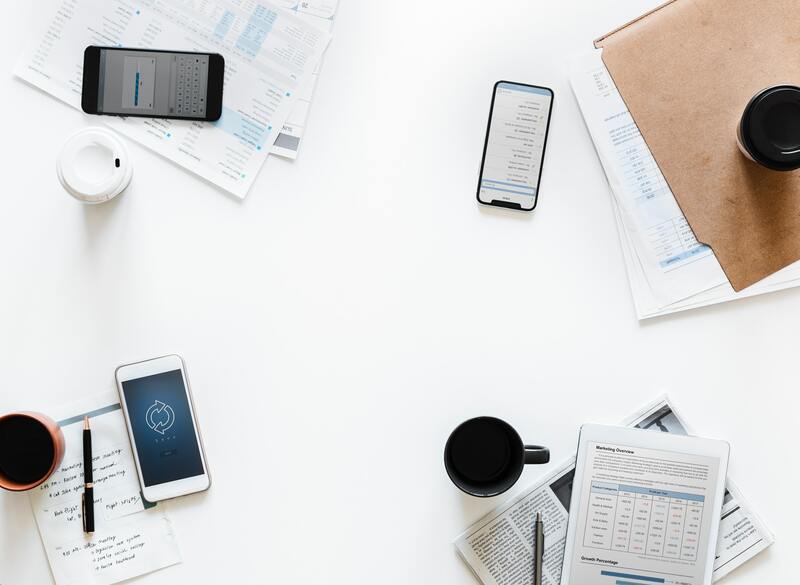 Utilizing these services not only eliminates much of the exchange risk, but also creates workflows more akin to what traditional investors are accustomed to. Bitcoin was born 10 years ago to rid ourselves of systemic risks -- the Exchanges and the investors utilizing these exchanges need to remember that. Binance (BNB) retained value against the market this week, up 5% in a sea of red. The project has a Q1 2019 token burn approaching as well as the mainnet launch of its decentralized exchange later this month. Tezos (XTZ) saw positive price action to the tune of 18% following a successful quorum being reached for the second voting phase of Athens, which was a Proof-of-Stake voting protocol between two competing system-wide upgrades to the network. Read here to learn more about Tezos Athens. Litecoin (LTC) has led the market surge since November 2018 lows, with high-to-low appreciation of over 400%. However, this week “digital silver” bled more than its highcap counterparts, trading 9% down this week. With the block reward halving approaching in August, all eyes are on Litecoin. Metal (MTL) surged into the weekend, up 12% overall this week on news that Metal Pay for Android is “launching soon”. This news event and the subsequent marketing blitz has led to around a 700% increase in daily volume, with the price action reflecting that (+24% in the last 24 hours). In Blockhead Capital’s Monthly Macro Research Report, the firm touches on why the global markets are poised for another crypto rally. They cite among other things a fractured global political environment, the manifesting of risks in the traditional financial system and excessive sovereign debt issuance. Last week, popular crypto exchange Bittrex was notified by the New York Department of Financial Services that their application for a BitLicense had been rejected and that they had to cease trade operations immediately in the state of New York. The NYDFS cited that the exchange’s customer due diligence and KYC/AML program were seriously deficient, with customers opening accounts using names like Donald Duck and Elvis Presley. The bottom line: Exchange risk is still the #1 risk that asset managers need to protect against. Oracle’s group vice president of blockchain development, Frank Xiong, commented last week while attending the Forbes CIO Summit that he expects 50-60% of all companies to use blockchain technology in the next few years. Despite positive metrics around adoption - 100 of Oracle’s customers use some form of a blockchain - Xiong reminded the audience “we’re past the stage that blockchain can cure everything, so people are becoming more realistic about what’s good for their business model." In a follow up to a post from last year, USV analyst Dani Grant details how she is rethinking projects built on distributed computing systems. Originally her thesis explained that developers would choose distributed systems only if they were cheaper than centralized systems, however, she now claims that distributed compute systems are more compelling as they offer developer integrity. In this case, developer integrity means assurance for developers that a centralized power will not disappear or change access to APIs or other features that would materially impact their projects. The results of a Twitter poll from the International Monetary Fund indicate that 56% of respondents believe they will be using cryptocurrencies to pay for their lunch in five years time. While this is incredibly optimistic for the industry, we’re still a long way from this reality with hurdles such as micropayments and tax implications. The Token Taxonomy Act (TTA), a bill that pushes for cryptocurrencies to be exempt from securities laws, was reintroduced last week in response to the SEC’s recent token guidance. The TTA, which was introduced to Congress last year, has a few updates including a clearer definition of digital assets and strengthens consumer protections. Grayscale’s Q1 report explores the performance of its various investment trusts which had the first positive quarter of returns since Q4 2017. The report includes interesting data about how some of the top assets held in its trusts performed, which sheds light into how retail flows are entering this space. Breakermag has collected a list of blockchain projects that are aimed at using blockchain technology for social good. Projects are categorized based on area of impact: Funding and Donations, Environment, Food and Agriculture, Gender and Sexuality, Government, Healthcare and Medicine, Identity and Banking, and Information and Education. This demonstrates just how far-reaching these technologies can be.